Fifa 19 is just around the corner and there will now be a special release for the Swedish football fans in the Swedish Mediamarkt Länna store! 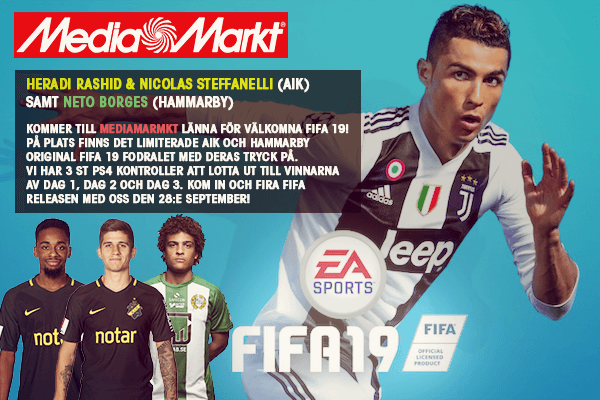 Heradi Rashidi and Nicolas Steffanelli from AIK and Neto Borges from Hammarby will be at the shop to welcome FIFA 19. There will be special covers for the Fifa 19 game at place, one with Hammarby and one with AIK with their prints on. They also have 3 ps4 controllers for lottery for day 1, day 2 and day 3! So if you’re a big fan of those teams this is really a great opportunity to get a very special edition of this years Fifa 19!